Re:amaze now integrates with Aircall.io! 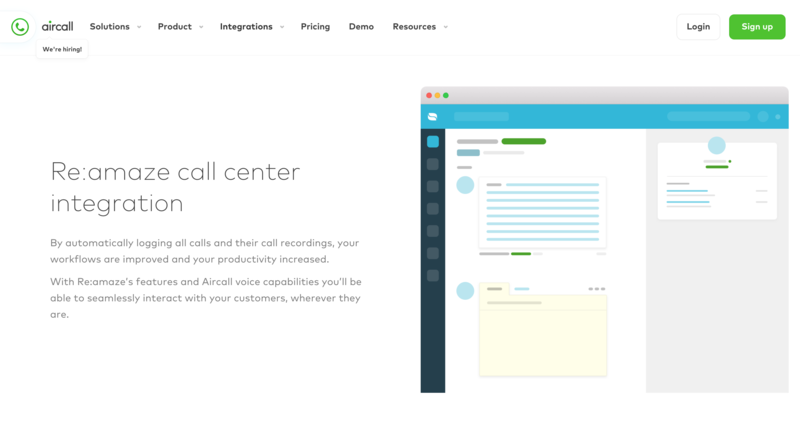 Aircall is a cloud based call center software and call center app designed for businesses that need voice support in their business. Any growing business will tell you that the need to add voice call support is essential in making sure customers are happy and well cared for. While some customers will prefer email or live chat communications, others will opt to pick up the phone and talk to a real person. With Aircall, businesses can easily provide customers who prefer phone solutions a call center experience. Integrating with Aircall with Re:amaze enhances your ability to provide seamless customer service alongside your other channels such as live chat, email, social media, SMS/MMS, and FAQ. This first iteration of the partnership between Re:amaze and Aircall brings you the ability to bring in Aircall call recordings and Aircall voicemails directly into your Re:amaze dashboard. For customers that have phone numbers attached to their identities will automatically be associated to incoming Aircall recordings and Aircall voicemails. The two development teams at Re:amaze and Aircall is working together to enhance the integration so businesses can eventually make and take inbound calls directly within the Re:amaze dashboard!